Though little known, the office of the Public Trustee, is one of the oldest and richest government departments in the country. Things over the years however, have not gone too well for a department which is supposed to win the ‘Trust’ of the public. According to its 2016 Performance Report to Parliament, it had 1,067 active trusts, 140 active estates and contributed a little over Rs 14 million to the Treasury. From 2012-2014 however, it was contributing an average number of Rs 6 million to the Treasury, even though 35 active trusts and eight active estates were added to its portfolio during the same period. A damning 2015 Auditor General’s report highlighted that the Department had failed to fulfil the objectives by 30 May 2016 of the owner of a property of Shrima Indrani De Soyza who had died on 14 April 2007, even after nine years of her demise. Furthermore, the house and its properties belonging to the owner of the estate had been given to a female officer in August 2009 who had been employed in the department by that time, without an agreement or levying rentals. When you are dealing with the dead, there is none to question whether you have done the right thing. But the current Public Trustee, Sanath Weeratne who completed a year in office at the end of May this year, is determined to turn things around. He hopes that with the right systems in place, the above issues will remain in the past and the dead will find peace in his Office. “The concept of the Public Trustee initially started in New Zealand, then spread to Australia and England. Later to Hong Kong, Sri Lanka and Singapore and certain US States. They started it because they could not find a private trustee in the colony they could trust to take care of their estates”, he said. As large amounts of cash and property had to be managed, from the start, the emphasis had been to appoint a Public Trustee who was an independent and non-political person who will act with transparency, especially financial transparency and accountability, he added. Today, New Zealand with a population of under 5 million people has its Public Trustee office manage 35 regional offices (as of 2007) to serve their citizens, 450 employees and manages about 330,000 last wills. They also provide a free legal service to help citizens draw up their wills. Costs are recovered once the wills are executed after the demise of the person. “They manage about 350 massive dairy farms and on average they write 21,000 last wills every year. So these are good examples of how a Public Trustee office can service a country. We are not quite there yet”. The question is can we get there? 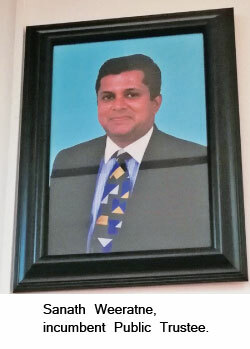 The Sri Lankan Public Trustee office operates from just one place; Thurban House donated by the late Sir D. B. Jayathilake in his own last will. Sir D. B. had insisted that the Office operate from his home as long as it functioned in the country. In this house, a cadre of 87 run 1,190 trusts (as of 2018). In the last 12 months, Weeratne said he had worked hard to first and foremost install systems in place, “We have very big portfolio of cash assets and a very big portfolio of properties. It is a huge task but the important thing is that we have to have systems in place”, he said. Change has come in both small and big ways. As a place that dealt with a lot of paper, none had thought to have fire extinguishers. So this was firstly installed. Further, an insurance policy was taken on for not only the land and building but also for all the last wills they stored. “Our plantations were suffering massive losses because no qualified superintendents were appointed to look after them. Now a consultant manages 500 acres of estate and the profits are showing. For me it is a joke if the Public Trustee can man plantations around the country from Colombo 7 on a remote basis”. “Any public department needs standard operating procedures, we did not have that. We manage 1,190 trusts and a cash portfolio of Rs 2 billion, if we have a manual, it won’t matter who occupies this place, he/she will know how the organization runs”, said Weeratne. This, he believed will lead to more transparency. A must when dealing with someone else’s property. With that objective, he has also taken steps to re-activate their website which had not been active for the last 10 years, “In my view the Public Trustee should not think twice or stutter to publish all of the trusts that are under the Public Trustee department on an active website. We should have on display all the profit-loss accounts and the balance sheet of all those trust properties we manage. Because it is trust property, not private. We give it to Parliament and are being audited by the Auditor General but how many look at the Hansards? The idea is to serve the people who are here or domiciled abroad. They should be able to log on to the website and see how we run, and say it looks very transparent and that we are managing well. It is only then they will build some confidence and they will think of writing last will and investing properties with the Public Trustee”. To upload all accounts online, the Public Trustee has also taken steps to update their accounting software, an MS DOS system which was introduced in 1995. By 1995, the DOS system which was introduced in the 1980s was fast disappearing and thus it is unclear why the Trustee at the time chose to go with this- today this system is obsolete. “Being a department that handles 1,190 trusts with each trust on average having at least three objectives, we would be at least handling 3,500 objectives which need to be fulfilled over 12 months. Some are stretched over a year, or every six months, monthly, quarterly. So, if you have a software system with a workflow which generates precedence; a person walks in and opens a trust (everything is built in), you type in variables and it takes care of things and sends an acknowledgement to the settler saying this has been done. So if you have a precedent based workflow chart, it improves efficiency and also gives transparency”, he explained. He added that the idea was to have all the information on a person’s trust, that is his/her, starting balance, current balance, rate of interest, objectives, what the department has done on one page, “That in itself is a forensic audit which we can attach to each of the 1,190 trusts and send to Auditor General. That is transparency and that is where we need to go”. “We asked for the allocation and the Treasury agreed. The Treasury does not have a sixth sense about these things. We had not asked for all these before. Rs 3 million for our accounting software was given”. One more important allocation Weeratne had requested for was the money to cover legal expenses of Department. The Public Trustee Department technically manages these trusts and estates on behalf of the government. Thus it has very little or no savings of its own. As a government department, its staff salaries are covered by the Treasury. A problem however crops up when they have to litigate on behalf of one of their trust properties. Weeratne explained it as, “If you open up a Trust or Fixed deposit, we charge from your deposit (4-8 percent), interest and capital charges. If your property generates income, we charge that for the Treasury. Say person A leaves behind a lot of property but no liquidity and person B leaves the same extent of property but also has a lot of liquidity. But Person A’s estate has litigation and the Public Trustee has to spend money to litigate. The Trustee has no money, so he dips into the money in Person B’s estate to litigate A’s estate”. This practice today has snowballed, resulting in many estates running into millions in debt. “To me this is nonsensical and against the principles of Trust Law. It is not fair even if you are to look at it in ethical terms. The person would not like us using his money to litigate for another”. He further explained that at times in the past, the Public Trustee had chosen not to take steps in relation to properties, where the Trustee is the executor, purely on the basis that the Department had no money. This happens because we simply have not requested for that allocation from the Treasury, he added. Weeratne having brought this to the attention of the Minister has had a favourable response towards granting this legal fee from the Treasury, “We are in the process of requesting it in the next budgetary allocation”. Getting legal fees sorted not only covers the errors of the past but it will also provide for the future when the time comes for the Trustee to litigate on the 254 last wills which were asked to be opened after a lapse of 67 years. “Out of the 254, 160 declare the Public Trustee as the executor. So we will have 254 testimony cases to launch proceedings in. It is a huge task. We are looking at properties tucked away for the last 67 years, these lands have probably had 2-3 generations enjoying it illegally, so we also have land ejectment cases. This is a large volume of legal work to be done simultaneously”. Having instituted all this change, Weeratne passionately believes that the concept of the Public Trustee has to be taken out to the people. The best way to do that would be to have branches around the country that is more accessible to the people. We should not be expecting someone from Jaffna or Matara to come all the way to Colombo 7 to submit his last will, he said. He has suggested that they start small and start one branch office in the North and another in the South and develop from there. “Once we implement our system here, then it is a question of replicating it. If we have a proper website, the public can download the forms and submit many of the applications online. Even when asking for a charitable request. Anyone who has questions, can ask online without coming here”. When taking it out to the people, the Public Trustee is determined to emphasise that the Department is for all people in the country. In the last year, Weeratne was in office, he remarked that no non-Buddhist clergy has approached him for donations to religious institutions. The Office donates to public causes such as religious institutions, medical expenses of the poor and the education of children who can’t afford it. 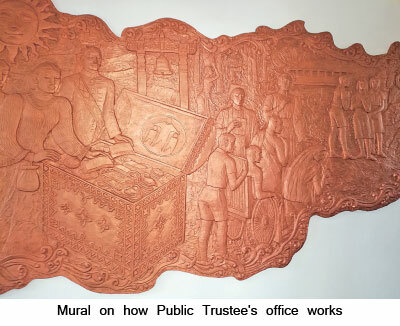 “There is a huge misconception that the Public Trustee predominantly serves Buddhists. That is wrong. I am a Buddhist but I am the Trustee for all Sri Lankans”. This misconception he said may have risen during the time the Department was wrongly assigned to the Ministry of Buddhist Affairs. Today it is rightly under the Ministry of Justice. “This year for the first time ever in the history of the Department, we had blessings from the clergy of all four religions when we started work on 1 January”, said Weeratne determined to create a more equal space for all in the Department. As the clean-up process within the Department takes place, Weeratne has also been asked to look at possible amendments to the acts which govern the Office of the Public Trustee. The Trustee has put forward two recommendations; one is to limit the time in office for the Public Trustee to around 4-5 years and to continue with the transparent recruitment process they started last year. The appointment should be advertised, gazetted, go through the usual processes and then approved by Cabinet, he explained, “Otherwise you are not appointing a Public Trustee but a political trustee”. At present a Trustee can serve up to his retirement age and that at times could go up to 10-12 years, but Weeratne believes that this is too long, “If we happen to get a Trustee who is not doing too well, this is a long time before we can get things back on track”, he said. The Ministry has also suggested that a governing board be appointed to monitor the Office, but this is a suggestion Weeratne is opposed to. Instead, he suggests that an advisory board consisting of the three public servants; the Auditor general himself, Solicitor General (no person less than a solicitor general) himself and a retired Supreme Court judge nominated by the incumbent Chief Justice. He explained that no country had a governing board above the Trustee as that would restrict his/her powers, “The Public Trustee has absolute, undisrupted discretion which he has to use. If you take Sir DB’s last will, it refers to ‘undisrupted, absolute discretion’”. When executing a last will, it was important that one person made the decisions that were required without interference from outside parties. Further, he stated that governing bodies could be made up of people from all sectors who would have their own vested interests in running such properties. “The country has a problem if you can’t find one honest man to be a Public Trustee, and if you can’t find one person, can you find 3-4 honest people to make up a governing body?”, he asked. Secondly it would also dilute the power and discretion and turn the Public Trustee to a ‘Custodian Trustee’, said Weeratne. “A puppet who would have to play to the tunes of politicos, bureaucrats and business people behind them”. He explained that with the proper systems in place, there would be enough transparency and accountability to not warrant another governing body above. “I don’t want to go down in history as the Public Trustee who diluted the powers of the Office”, he remarked. “We have to ensure that these properties are not misused and are open to investors who will come like scavengers. For example, Sir D.B. Sir D.B. asked that his coconut estate remain as it is? Some may ask why can’t we use it for another purpose? But we must read it in the context of his legacy, he fought hard to promote agriculture during his lifetime, he would not want anything else on it. It is in that context that last wills must be seen”. Can you turn things around? Despite the progress made, it is not easy turning government departments around. Weeratne however, believed that if the Departments of Pensions and Immigration and Emigration could do it, so could they. “Direction and commitment from the top is important in any place to change things”, he noted. Following by example has also worked for him. When he wanted to install CCTV cameras in all the workplaces to ensure that the staff worked, there was much opposition. They agreed when he installed a camera in his own office. “We also need to provide a proper work environment for the people. No one wants to come to work with leaking roofs, rat poo on tables, etc”, he added. Thereafter, once the systems are in place, he believed that things will definitely start to look fresh at the Department of Public Trustee, “It is the little things that make a difference”. If you have any inquiries call us on +94 112 581 690 or Make Inquiry Now! Copyright Public Trustee Department. All Rights Reserved.